"I have been making art for more than 40 years. Fueled by a profound love of the natural world, my creation of art comes from a driving force to show the sacred landscape that surrounds me in all its complexity. I am endlessly searching for ways to express the visions in my soul. Art is the language I speak; color is my voice, design my words. Kris Mitchell grew up in Idaho. To be more precise, in the Treasure Valley, the heart of the lowland farmlands between the picturesque foothills of the Rocky Mountains and the Owyhee Mountain Range. Kris moved to Oregon in 1989 where she became inspired by the pastures and vineyards of the Willamette Valley and the ever-changing hillsides of the Coast Range she now calls home. Her recent work consists mostly of en plein air landscapes, weather permitting, and exploring techniques that push the limits of her artwork when its too wet to go outside. 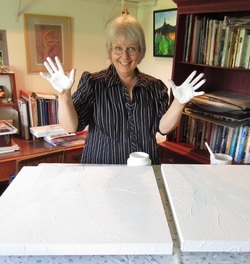 Kris is a much admired and loved art instructor at Linn Benton Community College - Benton Center and she teaches workshops throughout the central Willamette Valley of Oregon. Kris stays active in many art groups around the local area. Combining her favorite things; traveling, painting, and helping others to enjoy the same.